Kingsley Academy have held a wear it pink day at their school for the last few years and can’t wait to do it all again on Friday 23 October. Mrs Wayne is the lady who leads the pink fun in school and she would like to tell you a bit about what they have planned. We are all very excited here at Kingsley Academy as we approach our 3rd wear it pink day in October. This is the one day of the year where students can wear one item of pink clothing in addition to their uniform. We have raised over £1,000 in the last two years and we all really hope to do well again this year. Our year 8 and 9 Charity Coordinators will put lots of pink balloons on the gate and have our pink buckets ready and waiting, to collect any small donation that comes our way from all students, staff and even people from our local community. We even have additional wear it pink wristbands to sell this year too. Our academy restaurant will be making some pink cup cakes to sell at break time and we even have this year a ‘Pink Shoot through the Goal game’ which will hang high above the goalpost and students will be able to shoot the footballs through the goals. 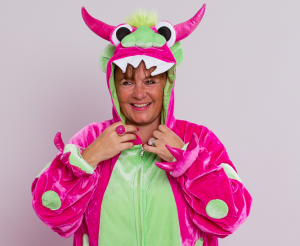 At the end of the day we will hold an assembly for year 8 and 9 and I will surprise them by wearing my pink monster outfit! I will reveal how much we have raised for such a personal and worthy cause. Our students really enjoy fundraising to support the research that moves us towards a future that’s free of breast cancer and helps save lives. Go on… why don’t you support wear it pink this year and bring some pinkness into your school! If your school will be wearing it pink this October, be sure to check out our fantastic schools resources including assembly plans, student fundraising kits and lots of easy fundraising ideas to help make your day a great success.